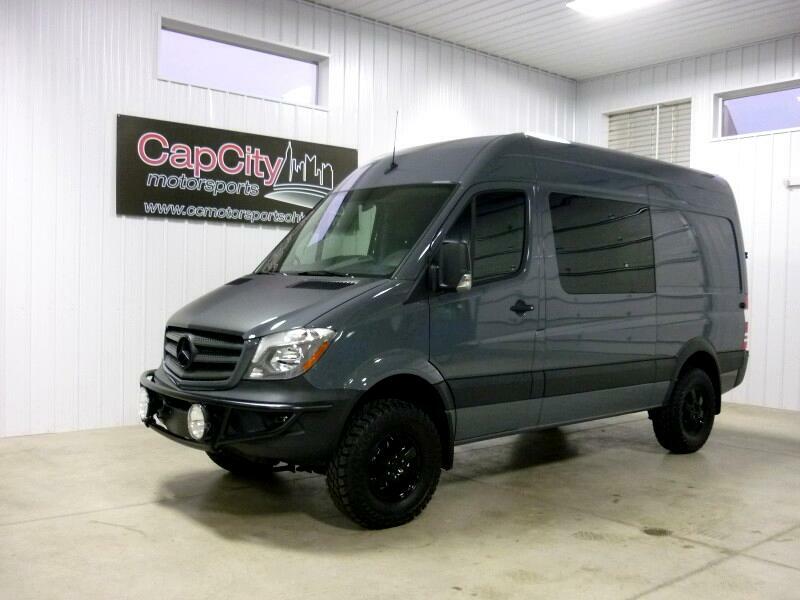 CCMS is proud to offer this brand new 2018 Sprinter 4x4 Crew Van in the 144" wheel base with a FULL Adventure Wagon kit we just finished installing! This one is finished in Graphite over Charcoal from the factory. In addition to adding the Adwagon base kit, we also did the full Auxiliary kit with dual 6V inline batteries, Webasto Airtop 2000 Heater, Coin floor, Dual Maxxair Fans, Aluminess front bumper guard with Hella 4000 lights, Rear Ladder, Painted factory Mercedes Alloys wrapped in Copper AT 255/85-16 tires! We then outfitted this one with 3 full Mule bags, the MOAB Elevator bed, matte black hood protection and a full set of custom thermal window covers made with Thinsulate! The Van is AWESOME! These are hard enough to come by with no build-out, so don't miss this one that is READY TO GO! Call or email for more info!